About Baidu.com (baidu.com): The leading Chinese language search engine, provides "simple and reliable" search experience, strong in Chinese language and multi-media content including MP3 music and movies, the first to offer WAP and PDA-based mobile search in China. Baidu.com is ranked #6 in the world according to the three-month Alexa traffic rankings. The time spent in a typical visit to the site is approximately eleven minutes, with 29 seconds spent on each pageview. Compared with internet averages, the site appeals more to Asians; its visitors also tend to consist of women under the age of 35 who browse from work and school and have no postgraduate education. The site is in the “” category of websites. Baidu.com has been online for more than eleven years. Dengan mendaftar blog ke baidu maka website kita berpeluang terindeks oleh baidu, bahkan jika bisa tampil pada posisi 10 SERP maka berpeluang untuk meningkatkan trafik dari china. 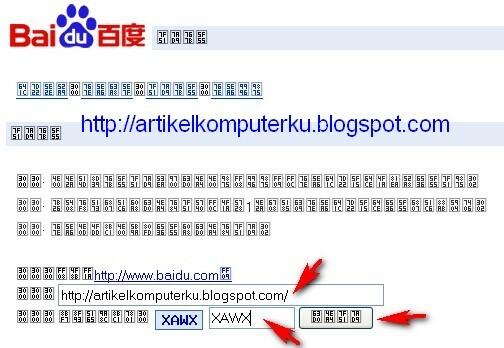 Tujuan mendaftar ke search engine ini adalah mengharapkan trafik dari negara Cina yang tentunya akan dapat membantu dalam optimasi seo blog. 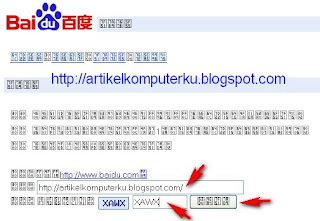 Selain baidu, anda bisa juga mendaftar blog ke search engine rusia dengan klik disini add url yandex , serta mendaftar blog ke search engine utama lainnya yaitu google (google webmaster center) , yahoo (yahoo site explorer) dan bing (bing webmaster center). makasih mas infonya. walaupun kesulitan bahasanya, sy translate dulu di google translate. hehee. Bagus nih baidu. makasih infonya. makasih atas infonya ya sob..